Manchester is now home to the second largest Wi-Fi network in the UK as it completes a network extension. The European City of Science, now home to Media City UK, has increased its free Wi-Fi service beyond the city centre to selected district high streets. The expansion of the Wi-Fi network is a key requirement of the City Council. Run by communications infrastructure company Arqiva at no cost to Manchester, the _FreebeeMCR Wi-Fi network offers 30 minutes of free Wi-Fi access per day, and has more than 80 on-street access points within the city centre. But some tourist and government Manchester websites can be access via the Wi-Fi hotspots for an unlimited timeframe. Around 30,000 people have used _FreebeeMCR to date. 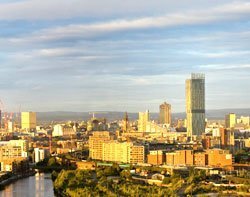 Back in 2006, Manchester expressed its interest to build a citywide wireless network, which would cover up to 400 miles – 90% of the Greater Manchester area. Leese said at the time that the council had been inspired by the success of wireless and broadband networks in other leading cities around the world, such as San Francisco and Amsterdam. The city hoped that a citywide network would boost its credentials when applying for government digital advancement funds. Today, the city is a UK leader for media digital technologies, with a brand new MediaCity UK complex situated on the waterfront at Salford Quays, and the BBC and ITV taking up residence in the area. Towards the end of last year, Birmingham City Council teamed up with Virgin Media Business and Global Reach Technology to provide free Wi-Fi throughout its city centre. Birmingham’s Wi-Fi network uses surrounding objects, such as CCTV poles and streetlamps, to boost frequencies, and can also be used by UK mobile operators to boost their mobile network capacity.